These slow cooker turkey meatballs are homemade, satisfying, and hardly any work. They’re packed with flavor, incredibly tender, and keep perfectly for lunches during the week! Pair them with a salad, on top of spaghetti, stuffed inside a roll topped with provolone cheese, or with a side of garlic bread. No matter the way, these are my favorite! I’ve gotten a few requests for everyday dinner recipes that I make. One of my favorite meals is this slow cooker turkey meatball recipe— I easily make it 2-3 times a month. These are massively flavorful, satisfying, and hardly any works. It’s one of those “set and forget” recipes. How to Make Slow Cooker Meatballs. Here’s how I make them. You likely have all, or most, of the ingredients in your kitchen right now. You’ll add the ingredients into a large bowl, roll up the meatballs, and brown them in a skillet before placing them in the slow cooker. There’s two reasons for browning the meatballs: 1) insane flavor and 2) it “sets” the meatballs so they don’t fall apart and turn this recipe into a meat sauce— though still incredible. This recipe makes about 24 or so meatballs, so you may need to brown them in 2 batches depending on the size of your skillet. It takes about 10-15 minutes total but worth every minute! The slow cooker ingredients: diced onion, two 28-cans crushed tomatoes, and fresh basil. The onion and basil are imperative for flavor. The meatballs will cook on low for 6-7 hours, or high for 3-4 hours. As the meatballs simmer and cook, they release flavor into the sauce and become incredibly tender. Good things happen in the slow cooker. What makes me even happier: With just us 2, this recipes makes tons of leftovers. So Versatile; Hard to Pick a Favorite! There’s absolutely no reason to use store-bought meatballs or sauce when you have this recipe. The store-bought has nothing on this. 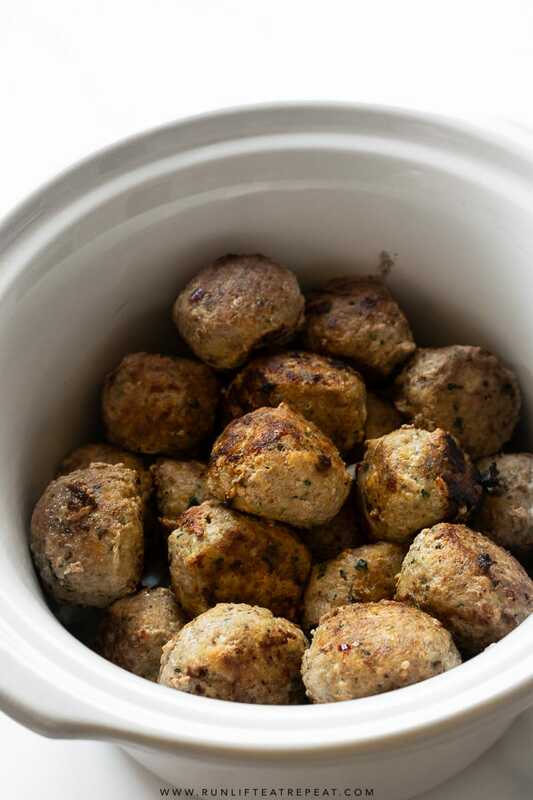 This slow cooker turkey meatball recipe is homemade, satisfying, and hardly any work. They're packed with flavor, incredibly tender, and keep perfectly for lunches during the week! Pair them with a salad, on top of spaghetti, stuffed inside a roll topped with provolone cheese, or with a side of garlic bread. No matter the way, these are my favorite! Line a large baking sheet with aluminum foil. Set aside. Add the ground turkey, milk, egg, Panko, 1 Tablespoon olive oil, garlic, oregano, basil, parsley, onion powder, red pepper flakes, salt, and pepper into a large mixing bowl. Mix everything together until the ingredients are combined— the best tool for this is your hands. Roll into desired size balls, these are a little larger than a golfball which is about 2 Tablespoons each. Place the rolled meatballs on the large baking sheet. Place the died onions at the bottom of the crockpot and top with 1 can of crushed tomatoes. Add the remaining 1 Tablespoon of olive oil to a large skillet over medium-high heat. Lightly brown the meatballs for about 1 minute on each side— depending on the size of your skillet will depend on how many will fit. It's important that you do not skip this step. Layer the meatballs into the crockpot as the batches are browned. Once all the browned meatballs have been added to the crockpot, pour the second can of crushed tomatoes on top, and top with the fresh basil. Cover and cook on low for 6-7 hours, or high for 3-4 hours (at that point, the nternal temperature of the meatballs should be 165ºF+). Serve on top of spaghetti, paired with a salad, stuffed inside a roll topped with provolone cheese, or with garlic bread. Store leftover meatballs covered tightly in the refrigerator for up to 5 days. Make ahead tip: Prepare the meatballs through step 4. Cover and refrigerate browned meatballs for up to 1 day. The next day, continue with step 5 and cook as directed. You can also fully prepare 1 day in advance, refrigerator overnight, then cook in the crockpot on low for about an hour or until warmed. Browned meatballs (not fully cooked) can be frozen for up to 3 months— add an extra hour to the cook time if frozen. 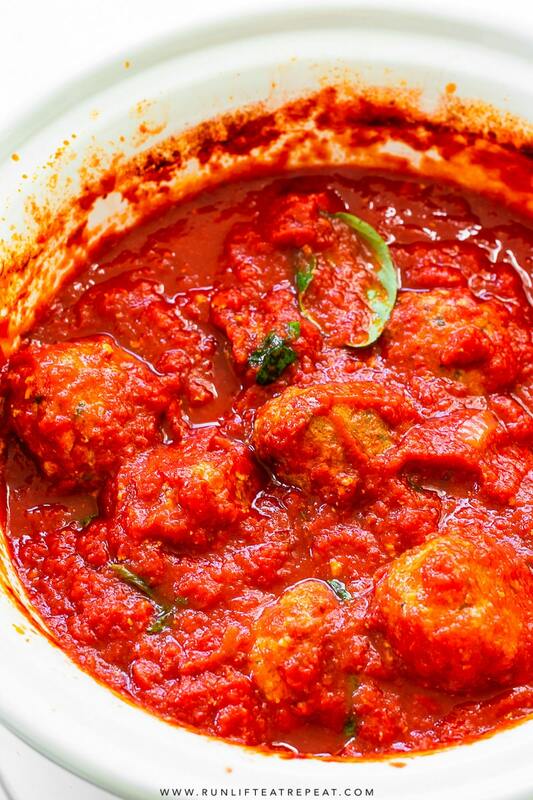 Cooked meatballs in sauce can be frozen for up to 3 months. Don't have a slow cooker? Prepare through step 4. Set the browned meatballs on the large baking sheet. Add the onion, crushed tomatoes, browned meatballs, and fresh basil to a large pot. Turn the heat to medium-low, cover with a lid, and simmer until the meatballs are cooked through— about 35 minutes. 1. I prefer to use ground turkey to keep these on the lighter side, but feel free to use ground beef or your favorite combination. 2. Any type of milk can be used. To keep these dairy-free, I use unsweetened almond milk. What remaining can of crushed tomatoes please! Hi Judy. The recipe has two (2) cans of crushed tomatoes; you’ll add one with the diced onion first, then add the meatballs and then pour the remaining can on top. Let me know if you have any other questions. Hi Mike. The almond milk helps make them more tender, but you can use regular milk (any fat) as well. Typically I would use 1% or 2%. I’ve added it under additional notes as well. Let me know how you like them! 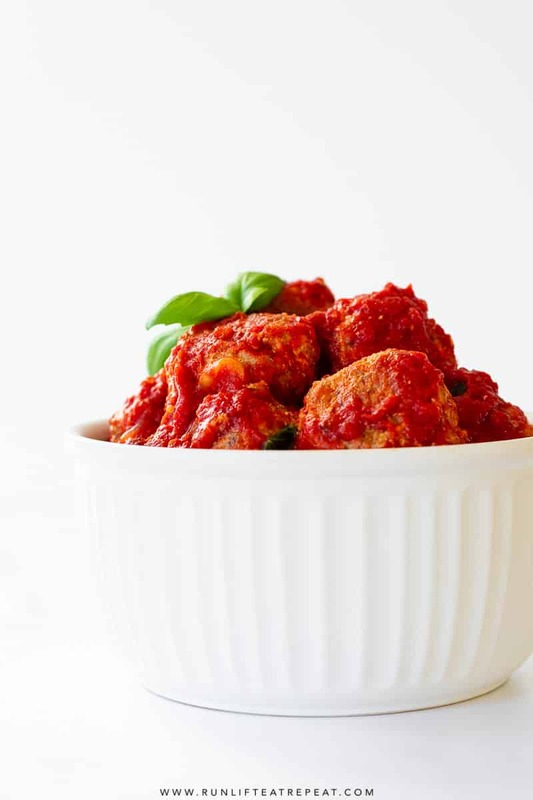 I love meatballs in sauce actually my dad was the one who made Turkey meatballs so tasty your look with the spices and mix and the fact that the meatballs and sauce had so much time together tells me that is going to be one amazing Meata ball! So here’s my take on this. Let me start by saying I made this and it was good. I wouldn’t say great. I kind of felt it defeats the purpose of slow cooker/crockpot cooking, which to me serves two basic purposes: either ease (throw a half dozen ingredients in and turn it on and walk away), or braising (taking tough roasts and hard root vegetables and breaking them down until they’re tender). This recipe requires making the meatballs in a bowl (I kind of love doing that – like playing with play dough! – but only when I have time), then using a skillet to brown them, then transferring them. I served with linguini so I had a pasta pot and colander to clean up as well. By the time I was done I said to myself, I could have made this in 90 minutes on my day off the standard way – on the stovetop. I also felt the meatballs were a smidge dry. I don’t think slow cooking is best for meatballs. So all in all, I give this a B- rating. You had me at meatballs. I have made them before in the crockpot but skipped the browning because well I’m lazy when it comes to my cooking sometimes. I will have to go the extra mile next time because these look fantastic. What a great idea to use turkey meat instead of the traditional mince meat! So much healthier too! Your meatballs are looking delicious, I’m sure my family is going to love this recipe! What good timing! I was just looking for a slow cooker meatball recipe!. Planning on making my meatballs this weekend for meal prep the coming week. Thanks for sharing this! Let me know what you think of them! They are a favorite in this house! These are the BEST meatballs EVER!!!!! My brother loves Turkey and he love cooking as well. I am definitely forwarding this recipe to him so he can devour it. No doubt that he’ll love these. This recipe is a favorite for my husband! These look like the perfect meatballs! I think my favourite way to have them would be on a pile of spaghetti with lashings of parmesan and garlic bread! Call me greedy but I think I could eat a whole load of these! Yum! Any meal made in the slow cooker is good with me. I love that you used turkey instead of the traditional beef or sausage. This sounds like a great addition to any pasta dish! I can’t wait to throw these on top of a bowl of spaghetti. I’m definitely making this! I just started weight watchers and this looks like an awesome weeknight meal that’s simple and would be great over veggie noodles. How would the recipe hold up to being cut in half? It should be fine – I’d still recommend using a whole egg though and maybe a tiny bit less than half breadcrumbs. You don’t want to make them too dry. BUT if you make the whole recipe, these freeze perfectly! You’ll see notes at the bottom of the recipe for that. We have being eating lots of chicken lately and i am ready to switch to come turkey! My slow cooker is ready for some homemade turkey meatballs! I can see why this is called “my favorite” because they look so good! I am always on the hunt for a new Slow Cooker recipe to help me get through all our busy weeknights! Cannot wait to make it!